James, congratulations on the weight loss! 26lbs doesn't sound like it could have been easy. Solid first day; good luck with the tests and beyond! I got accepted to Wil-Trans today! Congratulations to both James and Bill! It keeps getting better, too. After 25 years of retail management I decided it was time for a change. I was impressed with the way the handled the whole recruiting process and my recruiter Casey was top notch. I will be starting my new life adventure on 3/6/17 and both my wife and I are excited. We have have hope and plans that she will travel with me after I'm comfortable knowing the business. That said I have tons to learn and we are in know hurry. Hey James, I just got accepted to Wil-Trans this week as well. I am starting a week after you unless they have an opening on the 6th. My wife and I are empty nesters and are looking to do something different for the next few years until we retire. After I get some experience under my belt, and make sure I like trucking, my wife is going to quit her job and go through training as well. I have Chris as my recruiter and I can say he is top notch. Some of the first words out of his mouth were, "We are an OTR carrier, can you be out 3-4 weeks at a time?" He hasn't tried to snow me yet as far as I can tell. He also calls me each work day just to keep in touch. I applied at Prime as well and getting info out of the recruiter is like pulling teeth. I have been researching this for years and never once thought of Wil-Trans. It was this website that turned me on to them. So far it has been a positive experience. Best of luck to you! Hey good to hear you got on and you and your wife sound much like us! 2 more days and I'm headed to Springfield and getting really excited! Take care and hope to see ya sometime. 25 years of retail management and in 2 weeks I start training at Wil-Trans. I've been lied to, cussed at, worked 70 hour weeks, stressed over everything possible that retail delivers. 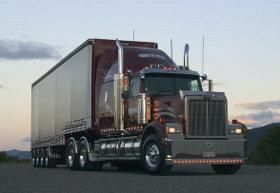 After months of reading and doing my homework I've decided that trucking will be a good move for me. The thought of being responsible for myself and not 50 other people and knowing I'm actually making a difference is exciting. I'm also fortunate to have a wonderful wife of 26 years who supports me and if all works out will join me on life's job and adventure. Thanks for sharing this post and thanks to everyone who contributes to Trucking Truth. This site has been very helpful! I have high blood pressure and although mine is considered level 1, when I see the Dr it skyrockets. My Dr put me on a non diuretic BP medicine and it's working well. I'm also learning to meditate and breath not deep just a little deeper. Drink tons of water and if you can get some dried plain apricots and start eating them. Calm down and relax. I just finished my D seat with Wil-Trans. Got my CDL on Weds and am back out on the road with my trainer. You're really going to appreciate your decision to go with Wil-Trans. Best decision I made. You'll see how many people go through Prime because we stay at the same hotel as their students. But when you're in a class with 2-3 students, you really get the one-on-one attention. And I think that's why I'm the 7th person to get their CDL on the first try this year. They really prepare you for it. So congrats. Congrats man! I really put some time in researching the different companies and options. Wil-Trans just really stood out. I'm looking forward to the opportunity and starting something new. Yay that is so exciting! I also start on the 6th but I will be with prime. Trying to prepare for the tons of knowledge that will be thrown at us for the next few months. Excited for this life change though. Starting Wil-Trans school very soon. Besides what I have read here, does anyone have any information on them and their training? Also any suggestions for a 50 year old rookie? Thanks!